Burnley's first season back in Division One (now the Championship) had come off the rails. After an excellent start we were fifth in the table at the beginning of December 2000, ahead of all our local rivals Bolton, Preston and even Blackburn. Then a run of poor results saw us go out of the FA Cup to Scunthorpe and lose eight out of ten league games which took us into a mid-table position. After the last of those defeats at Grimsby, manager Stan Ternent was in no mood for the waiting press and gave some rather strange answers when questioned about a proposed loan move for Manchester City striker Gareth Taylor. But Taylor duly arrived and three days after that Grimsby defeat was in the side that beat league leaders Fulham on a superb Turf Moor Tuesday. He'd arrived on a two month loan that would see him remain with the Clarets almost until the end of the season. Taylor had started his career with Southampton as a youngster but at the age of 18 was released by the south coast club and he moved closer to his home of Weston-Super-Mare and signed for Bristol Rovers. He was a central defender at the time and that was where he made his debut for the Gas in February 1992. It wasn't the best of debuts as they were beaten 6-1 at Cambridge. Taylor didn't play again that season or in either of the following two seasons. His next game was on the opening day of the 1994/95 season and by then his manager of the time John Ward had opted to use him as a striker. It was a decision by Ward that changed Taylor's career and he's never since been considered a defender. In that first season in the first team, playing alongside players such as Marcus Stewart, he netted twelve goals including two on the last day of the season that won them a place in the play offs. They lost at Wembley in the final but Taylor had made an impression, By the time the following season got underway there were clubs from higher divisions looking at him. He got off to a good start too, scoring four early goals including the only goal of the game as they beat Burnley 1-0 at Twerton Park to inflict on us our first defeat of the season. Taylor's days were almost over with Bristol Rovers and he was soon on the way to Crystal Palace in a deal that ultimately cost them £1.25 million. Unfortunately for Taylor he made no impact whatsoever at Selhurst Park, scoring only once for them. Less than six months after the transfer to Palace he was on his way to Sheffield United. His career was certainly back on the right path and he enjoyed a successful period at Bramall Lane that only ended when Manchester City came in for him and offered £400,000. He'd been with the Blades for not much short of three years and had scored 24 league goals for them. It was almost as if it was one good club, one not so good for him. Again he struggled to make an impact in over two years with City although he did make his Turf Moor debut in the 1998/99 season. That was the night City beat us 6-0 and we had to listen to Oasis at half time. Taylor played the full ninety minutes that night but didn't score. During the 1999/2000 season he had loans at Port Vale and QPR without success, but in February 2001 he finally arrived at a club where for over two years he was to have some great success. He played in all but one of our remaining games that season, missing the home win against Tranmere because his loan had ended. He was back for the next game when we signed him for a further month. He scored four goals in those games as we just missed out on the play offs. Peter Crouch was set to be the high profile signing that summer although Ternent confirmed that he also intended bringing in Taylor. He got Taylor, on a free transfer from City, but missed out on Crouch who considered Portsmouth under Graham Rix to be more ambitious. Taylor proved to be massively popular with the Turf Moor crowd. In his first season he helped us to within a goal of the play offs, and had his goal stood in the win at Deepdale (a poor decision that at the time didn't appear significant) we'd have ended in sixth place. He scored sixteen league goals that season, and he repeated that the following season although it wasn't anything like as successful for the club. But you could hardly point any fingers at Taylor who scored two in a 6-5 defeat at Grimsby and hit a hat trick as we crashed 7-4 at home to Watford. There was also one cup goal from him, the first in the demolition of Fulham in the FA Cup that took us to a quarter final against Watford on what proved to be a day to forget for the Clarets. In the summer of 2003 there were rumours that Taylor might leave but he was with us for pre-season and he played in the Isle of Man tournament. Then news came that Norwich had offered £300,000 for him and with finances as they were at Burnley there looked a very good chance he would be on the move again. Canaries boss Nigel Worthington confirmed Burnley were keen to sell but wanted more for him and they were negotiating. Unfortunately those discussions came to an end because Taylor suffering a very serious eye injury in a friendly against Leeds and there were fears that it might damage his career. The move looked over with when Worthington was linked with Palace's Ade Akinbiyi although it did appear that he would sign for Stoke. We didn't know then, but Taylor had played his last game for us. The injury thankfully cleared up quicker than first thought but before he could get back out on the pitch for Burnley we sold him to Nottingham Forest for £500,000. He made his debut for Forest as a substitute, replacing broken leg victim David Johnson. He kept his place for the next game and wouldn't you have guessed it, they were playing Burnley at the Turf. They beat us 3-0 and it was too easy for them. And hardly surprisingly Taylor was on the scoresheet, he got the third. Forest had reached the play offs in the previous season but they now had two seasons of struggle. They escaped in that 2003/04 season, Taylor scored against us again in a 1-1 draw at the City Ground. A year later they were heading for League One with Taylor by now the captain under manager Gary Megson. In 2005/06 season he was stripped of the captaincy and eventually left out of the side. In January 2006 he got out via a loan move to Crewe. Dario G wanted to take him permanently but he turned them down and in the summer of 2006 signed for Tranmere. After doing well for them in a season and a half he was on the move again in January 2008 and went to promotion chasing Doncaster. He scored just the one goal for them but it was a vital one coming in a 2-2 draw at Huddersfield. Following promotion he was in and out of the side. He had an opportunity to join Scunthorpe on loan but turned in down. However in March 2009, just past his 36th birthday, he signed for Carlisle for a month. He played five games before returning to Doncaster, scoring on his debut against Crewe. To add to all that Taylor also won fifteen caps for Wales, four of them whilst with Burnley. He scored just the once in a 4-0 friendly win against Scotland when he was with Forest. 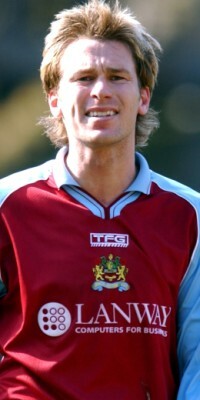 He could also have played in the Premier League having come so close during that 2001/02 season with Burnley. Playing at the top level is something that has eluded him during his career. At the end of his contract at Doncaster, on 7th May 2009, he was one of five players released at the end of their first season in the Championship. On 16th June 2009 Wrexham confirmed that Taylor had agreed a one year deal to play for them in the Blue Square Premiership, and in the summer of 2010 that was extended to a further year. He remained at Wrexham at the start of the 2011/12 season too, but after one substitute appearance he hung up his boots and accepted a coaching role with former club Manchester City.